If your dream is to study overseas in an International University, the ISIC Association and British Council IELTS in collaboration with The StudyPortals Scholarships is here to help you get there. This scholarship program is aimed at providing Study Aids for those who cannot finance their education. 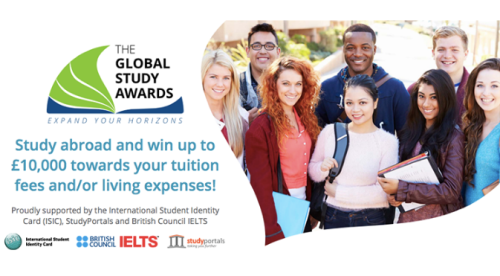 The ISIC Association and British Council IELTS in collaboration with The StudyPortals is offering £10,000 scholarship opportunities for individuals to study at any foreign country of their choice. This scholarship program will be awarded to outstanding students who wants to pursue an undergraduate or postgraduate program at any foreign Institution of their choice via normal admission window. 30th July 2017 for students that will start studying in Autumn 2017. 30th September 2017 for students that will start studying in Spring 2018.
have applied or applying for an undergraduate or postgraduate program at any foreign institution. Application is online, visit the Portals website for more details. Information about £10,000 ISIC Council Scholarships for International Students has been delivered nicely; interested and talented students who are eager to pursue their Free Tuition/Scholarships/Study in Overseas for Undergraduate, Bachelors, Postgraduate, Masters, PhD, Associate Degree and Other Degrees, can apply now.